AniMaybe: Spring 2010 - Kaichô wa Maid-sama! 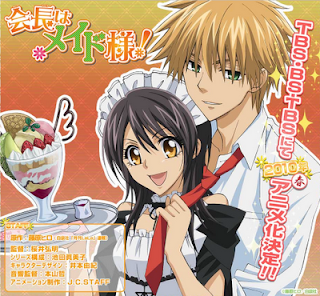 Of all of the new shows being pushed for this season, the one that I recognized right away was Kaichô wa Maid-sama! ["The (School Council) President's a Maid! "], an anime adapted from the manga running in Lala by Hiro Fujiwara. The anime is being produced by J.C. Staff, the studio responsible for Excel Saga, Utena, Azumanga Daioh, and the proposed Bakuman anime run in autumn of 2010. The series is also being directed by Hiroaki Sakurai, who has directed Sakigake! Cromartie High School and Daa! Daa! Daa! The general gist of the story fits in place with the current trend of the "maid-cafe" phenomenon in Japan--Misaki Ayukawa has a reputation to uphold at Seika High School as the first female school-council president in its history. Since Seika was once an all-male school that had been converted into a co-ed school, the student body is still primarily male and rooted in its laxness concerning student code. Ayukawa is rough on the boys for not sticking to the rules, often overworking herself to straighten the ship. Guys see her as a dictator, but fear her wrath; girls see her as a savior, but don't have the voice to protest things yet. However, Ayukawa has a second side to her personality, as poverty at home has forced her to moonlight as a waitress at Maid Latte, a quaint maid cafe. Ayukawa works hard to support her mother and sister, all while trying to hide her identity to the student body, but when one of the popular boys at school, the expressionless Takumi Usui, discovers her situation, Ayukawa is forced to work harder while her paranoia drives fear for her status in school. Pictures in the opening theme indicate that things will likely get romantic between Ayukawa and Usui, but there seems to be something...different between the character designs between the manga and anime. In the anime, Misaki appears to be a little too...what's the word...chipper? Perhaps it is due to the brighter colors, especially in the irises of the characters' eyes, but there's something that just sugarcoats Maid-sama! into something that is a little brighter than the original manga. Am I being picky? Probably. The other thing that really doesn't sit well is the introduction of time into the anime. The original manga took pride in presenting the stories as contained chaos--conversations would overlap, and as much empty space as possible was filled by art and word balloons. The anime takes that compressed area and expands it into a decent storyline that sticks to the original manga (at least for the first episode). For those that read the manga, this might take some getting used to. 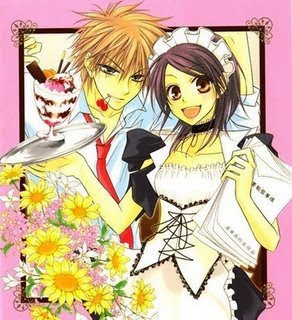 Those aspects aside, Maid-Sama! isn't your moe presentation of the maid-cafe culture, and that's a refreshing way to look at the obsession. I actually think the number of maid-cafes in Japan could be stagnating at the moment, so it is hard to say if a shôjo depiction of the trend would increase or decrease business. The series will likely steer the concern for the maid-cafe in the direction of the effect of work on teens in school and Japan's economic downturn, possibly in the way that Hana Yori Dango viewed class structure in schools. The focus appears to be more on Ayukawa's ability to hide such a different role from her peers, all while trying to prove that being a maid-waitress doesn't mean she's below Usui. I do hope that Maid-sama! can outlast some of the cutesy depictions of maids that anime has been used to presenting in the past, but I have my doubts. An okay start to the show, but I hope that something is added to the anime that keeps the manga's engaged spirit in mind.